CURRENTLY BEING REPRINTED - AVAILABLE AGAIN IN EARLY MAY. This invaluable guide lists common names of symptoms and helps you find the most suitable rubric in the repertory. Numerous cross-references, related rubrics, and synonyms are provided. Excellent for locating the repertory phrases and rubrics in Kents Repertory. 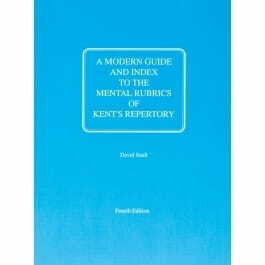 The book gives the meanings of Mind rubrics [in appreciation of the fact that the meaning of Kents language has changed radically since the 1880s] from the late 19th century Websters dictionary the one that Kent would have used. This book saves time in your use of Kents Repertory. It gives synonyms, and points you to the main rubric, sub-rubrics and related rubrics, which are often widely scattered throughout the repertory. This book should be sold as a concomitant to Kent, because it makes sense of that maze. In itself it is highly readable, the modern language enabling you to study the old-fashioned repertory with ease.